“Cinco de what? ?” That’s the reaction from friends here in the UK when I mentioned that I was working on a post for Cinco de Mayo. It’s not exactly a UK holiday; nor much of a Mexican holiday for that matter. Widely celebrated in the US, and parts of Mexico, it’s a national pride day for Mexican Americans – and an excellent excuse for tacos, guacamole, margaritas, cervezas and all food and drink that’s Mexican. Whip up a batch of Chicken Mole Enchiladas, one of my favorite Mexican dishes. Then wash them down with a Cilantro Lime Tequila Spritzer. I stumbled across this recipe when planning a Mexican cooking class and was intrigued. My prediction was it’d either be really refreshing and unusual (in a good way) or taste like an herb bomb. You guess the verdict. Start by making a lovely cilantro simple syrup, which provides sweetness and cilantro flavor, without the grittiness of sugar. Use this technique to create all sorts of simple syrups to use in cocktails or homemade soda (add a few tablespoons syrup to soda water). Try different herbs (mint, rosemary), citrus (orange, grapefruit), spices (cinnamon, peppercorns), coffee beans, ginger root, or concoct unique combos (lemon basil, ginger jalapeño, thyme peppercorn, etc). Even if you tend to shy away from jalapeños, rather than omitting them altogether, just add one thin slice. The longer it stays in the drink the more kick, so remove it when you want. Trust me, it is quite subtle and delicious. I predict that this cocktail may not just be limited to your (or my) Cinco de Mayo celebration. I foresee many fiesta Fridays on warm, sunny, summer evenings. Now come on, summer! And happy Cinco de Mayo! Note: As mentioned above, simple syrup is a really easy (simple, shall we say) way to impart different flavors in cocktails and homemade sodas. Follow this master recipe: 1 part sugar to 1 part water. For delicate herbs like basil and mint, follow the same technique below for the cilantro syrup. For heartier herbs, whole spices, coffee beans, cinnamon sticks, ginger root, etc. place the flavor source in the saucepan along with the sugar and water and simmer gently about 30-45 minutes, until reduced to 1 cup (250 ml). If your syrup yields less or more than one cup, don’t worry. For thinner syrup just add more to whatever soda/cocktail you’re making. For thicker syrup add less. First make a cilantro simple syrup. Combine sugar and water in a small saucepan and heat over medium-high heat until boiling. Remove from heat and add cilantro. Gently muddle the cilantro with a wooden spoon to release its flavor and aroma. You don’t want to mash it too much so that it disintegrates. Just gently tap with the wooden spoon until it looks slightly bruised and you can smell the cilantro. Let the syrup steep until cooled, about 40 minutes. Once cooled, strain out the cilantro and discard. Return the syrup to the small saucepan over medium-high heat until gently simmering. Reduce heat and simmer until syrup has reduced to 1 cup (250 ml), about 15 minutes. Remove from heat and cool (can place in the refrigerator to speed up the cooling process). 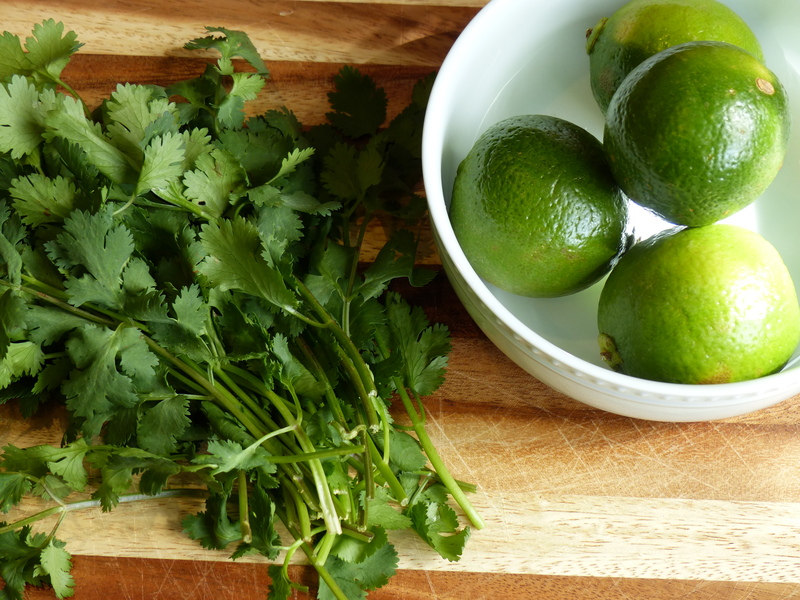 In a small pitcher or jar, combine 1/2 cup (120 ml) of the cilantro simple syrup, lime juice, and tequila. Stir well to combine. Fill 4 glasses with ice and divide the drink mixture evenly between the glasses (should be about 2/3 full). Top off with club soda and stir. Garnish with thin slices of jalapeño pepper. (You can make the cilantro syrup/lime/tequila drink mixture up to a day ahead, just stir well before serving.) Leftover simple syrup can be used to make another batch of these cocktails or add to soda water for homemade cilantro soda. These are very (actually TOO)delicious. Great on a warm summer day, so refreshing and healthy too. Love em!